Having a mentor to advise and teach you is a wonderful way to advance your skills in any given area. My first gardening mentor was someone I never met in person, but every week I eagerly welcomed him into my living room via the magic of television. James Crockett was the original host of PBS’s The Victory Garden. In addition to being a knowledgeable gardener, Crockett was a big advocate for composting. He called the finished product ‘brown gold’, and his three bin composter was called the Brown Gold Cadillac. I’ve never made Crockett’s composter, but thanks to his inspiration I’ve been composting ever since I planted my first garden. 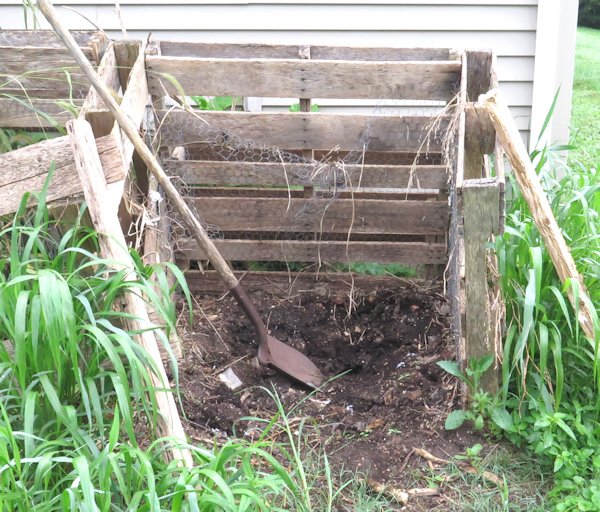 My early compost piles were made inside a ring of metal fencing, which was inexpensive and easy to make. I also used bales of straw in the past to hold in the organic material. When my wife and I moved to Happy Acres, we decided to make some compost bins from pallets we picked up for free. I called this arrangement the Brown Gold Yugo, since it was a low-cost composter but got the job done with few frills. It worked well for about five years, but eventually the wooden pallets started to rot and the compost bins began falling apart. It was time for a new composter, one I could build myself, and my wife and I decided to locate it on a concrete pad that a previous owner had made for a dog pen. I also decided to make it from rough sawn red cedar, which is naturally rot-resistant and should add years to its useful life. I came up with a plan, based on ideas from other compost bins I have seen, and construction began last week. I worked on it for three mornings, and you can see the finished results in the above photo. The composter is 8 feet long, 4 feet deep and 4 feet tall (more or less), with two bins. I sized the project so it could easily be cut from 8 foot long boards, and so the bins would have enough mass to build a ‘hot’ pile if I wanted to. I chose 4x4s for upright support posts, and 1x8s for the sides. I decided to cut a bevel on the top of the 4x4s to help water drain off, as well as to provide a decorative touch. I used my table saw for all the cutting on the project, though a miter saw or even a circular saw would also get the job done. Once I had beveled all the posts, I assembled the sides of the bins. I spaced the 1×8’s about 1/2 inch apart, to allow for air to get into the compost pile. Then I moved them out onto the concrete pad, and attached the 1×8’s for the back. I used #8 coated exterior deck screws for attaching all the pieces. I also gave my cordless drill a workout by pre-drilling holes for all the screws before driving them in. Cedar has a tendency to split, and I am happy to report that not a single board split on me for this project. After attaching all the back boards to the three side pieces, I cut 1×8’s to size for the front, which has removable slats. I ripped narrow strips from a 1×4 to make a guide for the slats. You can see that detail in the above photo. Borrowing an idea from Crockett’s Brown Gold Cadillac, I drove screws into the edge of the front slats and left them protruding about a half inch to serve as spacers. The slats slide between the guides, and can be added or removed as needed. I had also planned on giving the bins a removable wooden top, but the prototype proved to be too awkward to lift and maneuver. If we have a problem with animals getting in the bins, I will come up with something from hardware cloth or chicken wire. We started putting the bins to use as soon as they were finished. I’ve been moving the contents of the old bins, layering the partially composted material with fresh ‘green’ material in the form of weeds and kitchen scraps. I hope to break in the new bins with a nice hot pile of steaming compost. My wife and I are both pleased with the new compost bins, and I hope you have enjoyed reading about how I went about building them. As for the name, I’m calling it the Brown Gold Roadster, since it’s a ‘two seater’ with no top! This entry was posted in Gardening, Homemade and tagged composting, homemade, James Crockett. Bookmark the permalink. Love the new Brown Gold Roadster. You got that baby up and running in no time. It’s a big improvement over the old setup. Happy, um, rotting! Thanks Michelle! The pile has already heated up to 100°F as of this morning, so it appears to be well on the way to making the first batch of compost. One has to be a gardener to refer to a compost bin as stunning. But that is one stunning compost bin! I love your new bins. I wish mine looked so nice. I keep thinking I have to do something to make mine look nicer, but haven’t. It won’t be too many years before I have to replace my pallet bin. Love the Roadster, and from cedar too! Especially the beveled posts. What a nice job. I, too, fondly remember watching Crockett, and was saddened when he passed. As I remember, his “Cadillac” had 3 bins, and I built one at an old house 1000 year ago. I don’t remember using screw spacers. None of my composters now have removable fronts, and what a pain that is! Thanks Will! Your memory is good, his composter had three bins. That is definitely going to last for awhile. Gorgeous compost bin! It is almost too beautiful for such humble content. But as a fellow gardener, the output of this compost is indeed gold! Like James Crockett, you have also been a great mentor to new gardeners through your blog and your answers to my questions! How often do you turn your compost? Or do you only turn it when one bin is full? The weed and kitchen scraps you are putting in the bin now, will you get to use it this year? Or do you wait until next spring to use the compost? Thanks Echo! I’m pretty casual about making compost. I’ll harvest the compost from this new pile next spring. And I plan on turning it once, over into the 2nd bin. I generally get the compost a couple of times a year, once in early spring and then again in mid to late summer. If there are recognizable pieces that haven’t composted, I just put them back in the ‘working’ bin and let them compost a bit more! Looks good. We currently have a compost bin that is designed like a 20-sided dice. I’m not sure we give it enough care and feeding for it to be really effective. Plus, there’s only one compartment. How often will you “rotate” between bins? I don’t have a set plan for composting. I may rotate this pile into the next bin in a few weeks. It all depend on how much organic material we have coming in, and how much energy I have! Very impressive. I too remember Mr. Crockett extolling the virtues of his compost He would pick up handfuls of compost and let it run through his fingers as though it were gold coins. Two questions: One, how much time and money did this take? Two, do you make house calls? Crockett did love compost, that’s for sure. The materials cost right at $510 for the cedar lumber and exterior screws. And I would guess I put about 8 hours work into it. A trip to Carmel Valley sounds nice. I believe my to-do list is backed up for several years though! As Red Green would say, “if you can’t be handsome, at least be handy” – looks like you’ve managed to cover both angles. Beautiful work!